Make it easy for promoters to request bookings for your artists. 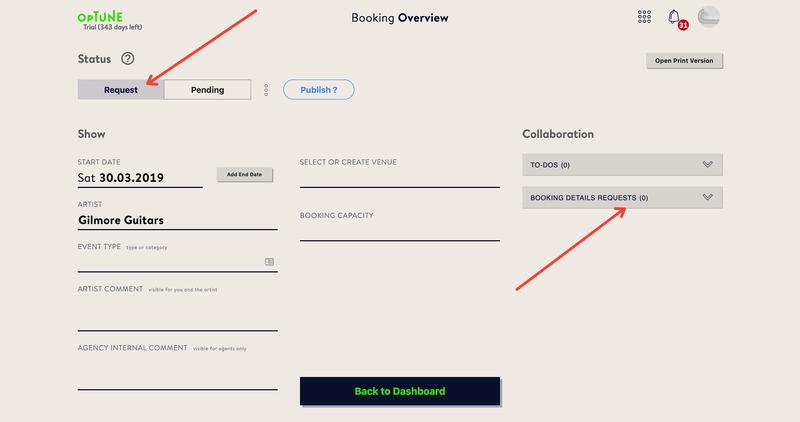 To integrate a Booking Request form from which promoters can choose an artist from your roster, go to your Dashboard and select AGENCY from the drop-down menu. At the "Agency Overview" page, scroll down and click on the PUBLIC WEBPAGES / CALENDAR FEEDS card. It will drop down, and you will see a selection of embed codes. 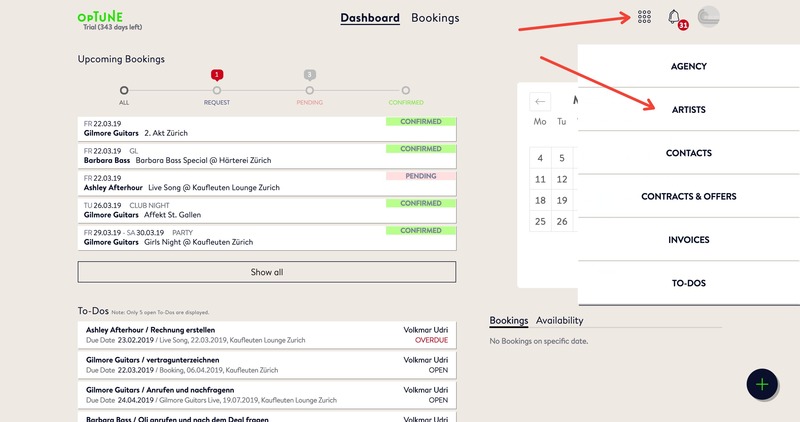 At the bottom of the list to the left, there is the BOOKING REQUEST WIDGET EMBED HTML CODE. Optune has set the default code to display the FULL BOOKING REQUEST form which includes all relevant information fields. Simply copy-paste the code to the site on which you want it to appear. If you wish to have a leaner form (less information fields), please contact us at Optune and we'll customize it for you. After you have pasted it into your website, you may now expect promoters to fill out the form and send requests to you. When this occurs, you will receive a notification in your Optune account. 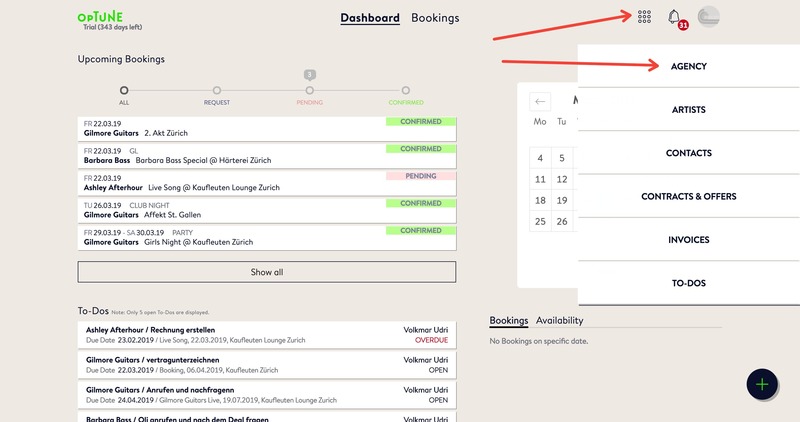 From your Dashboard, you can see that you have one or more notifications showing over the "REQUEST" marker under your "Upcoming Bookings". Click on the red marker and then select the tab showing the requested artist. This brings you to the Booking Overview. At the top left of the page, the "Status" of the booking will say "Request". After you've received the form from the promoter, and negotiations have been settled, you can click the "Pending" status button. Afterwards, when everything is finalized, change the status to "Confirmed". From your Dashboard, go to the drop-down menu and select ARTISTS. Select an artist from your roster, and click on the PUBLIC WEBPAGES / CALENDAR FEEDS card just below their profile information. 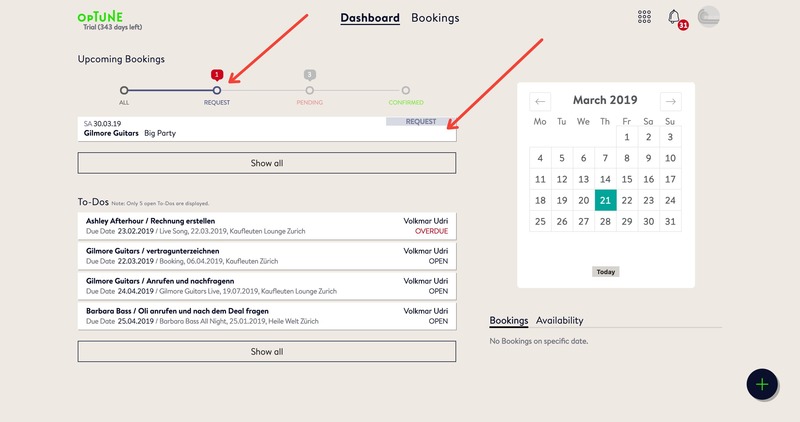 Scroll down until you reach the BOOKING REQUEST WIDGET EMBED HTML CODE. Optune has set the default code to display the FULL BOOKING REQUEST form which includes all relevant information fields. Simply copy-paste the code to the site on which you want it to appear. 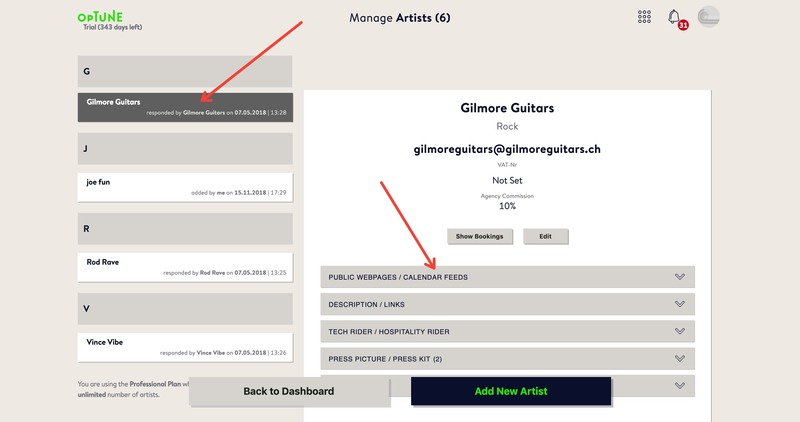 In comparison to the general agency widget explained above, this one now contains the name of the artist (branded), and is ideal for embedding directly into the artist's website. Once again you'll receive a notification when a request is sent for this artist.